BotF’s north Asia correspondent is in the process of experiencing a third summer in Beijing and never ceases to be amazed by the temperatures ranges experienced here throughout the year. North China quite literally has a variation of no less than about 55-60 degrees celsius; from -15’s in the depths of winter to +40’s in the peak of summer. Last weekend we experienced the upper end of the range with temperatures pushing mid 40’s. Köppen climate classification officially categorizes Beijing as being located in a “humid continental climate” zone or a region typified by large temperature differences with warm to hot (and often humid) summers and cold (sometimes severely cold) winters. Summers are great for sampling cold to very cold beers and winters are good for sampling … slightly less cold to very cold beers. Anyway enough about the climate and onto more important matters. The curiously named Ahornberger brewery is located in central western Germany approx. 20 kilometers west of the Czech Republic in the tiny village Ahornberg. The sampled offing was Feines Ahornberger Landbier Marzen chilled to slightly before freezing. 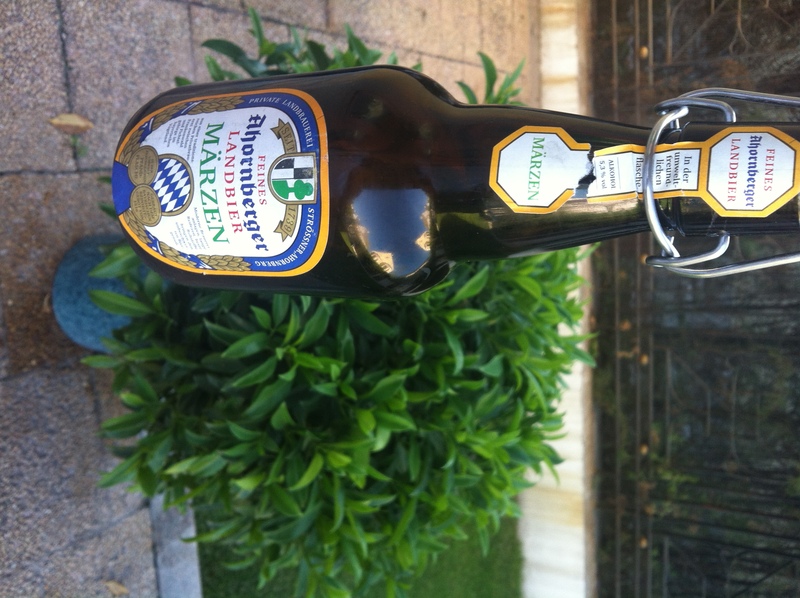 The “Marzen” sampled is a pale lager but its origins are in Bavaria and which according to the Bavarian Beer ordinance decreed in 1539 could only be brewed between 29th September and the 23rd April. Originally it was described as a dark brown full-bodied beer. However it could be described as being at the opposite end of the beer complex now that the Germans have hold of it and is a very flavorsome pale ale. They appear to be working hard to capture some of the China market and the entire back label is in Chinese characters but it is not bottled here. So do yourself a favour and keep an eye out for Ahornberger but please ensure to get the pronunciation right before asking for one. An outstanding post, TfT. I don’t miss the Beijing summers, but I do miss the beer range.